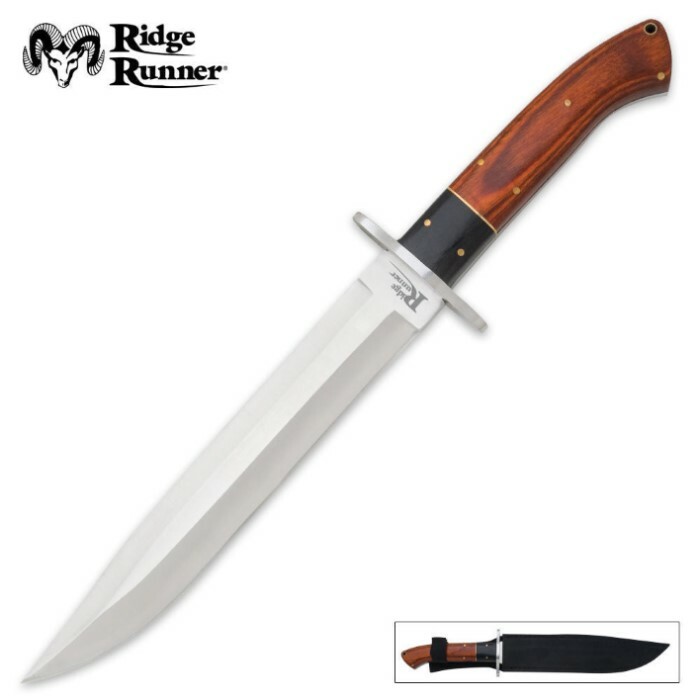 Ridge Runner Montana Toothpick Bowie Knife with Sheath | BUDK.com - Knives & Swords At The Lowest Prices! 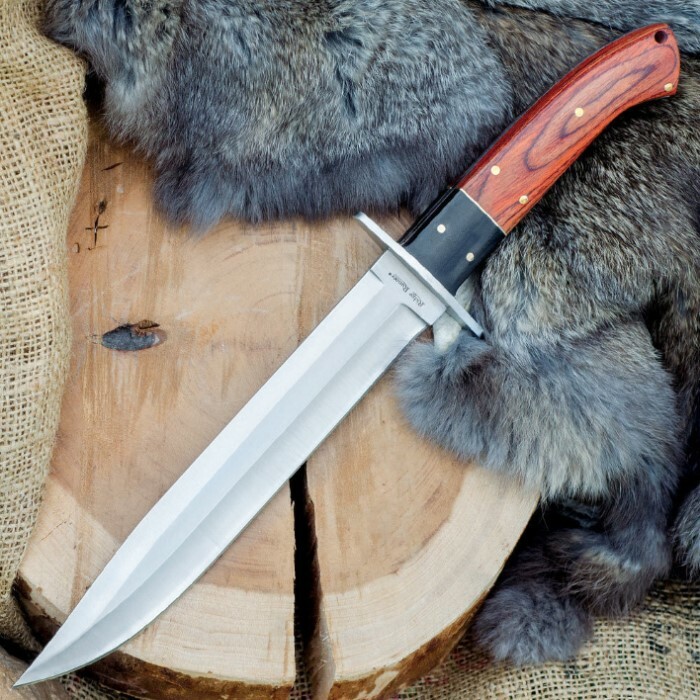 This Montana Toothpick has been created for the custom knife enthusiast who appreciates superb quality craftsmanship but understands it doesn't have to cost a fortune. I’ve been wanting this knife for quite some time now and the wait was worth it. The knife itself is very streamlined but very old school. The handle is a beautiful hardwood and the blade is full tang. For collectors, this piece is a great addition but can also hold its own out on the field. I recommend this to anyone. This knife has a perfect blade. Grind angle is totally consistent, no nicks or knurls and very straight alignment. Only flaws are in design aesthetics: the handle has a minor flaw where the spine meets the hilt, and on one side of the handle the brass wire is missing one, whereas the other side has two brass wires between the wood pieces. But the blade is perfect, and is pinned nice and tight into the handle scales, no looseness or rattles. I’d say it will be extremely functional, and unless inspecting it, the minor aesthetic flaws are not really noticeable. Perhaps for a collector, this would be a bigger issue, but ALL my knives are to be used. Last month I received this knife as my first "knife of the month club" prize! I'm impressed with the quality and the balance of this blade. Balance point is at the guard and assembly is of good quality. 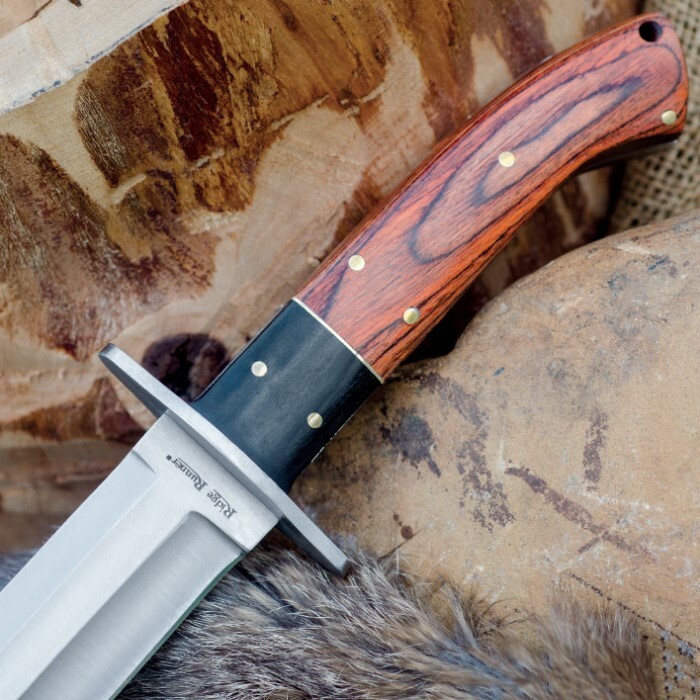 The sheath that comes with it is worth the price of the knife alone. I even liked the velcro keeper for the knife so you don't loose it from the sheath. My only issue is it wasn't very sharp when it arrived but my diamond sharpener made quick work of that. I'd definitely recommend this to anyone looking for this type of knife. Just got this bad boy in the knife of the month club. Super sharp and very well made. Thanks Budk! Definitely 5 stars. Not really heavy but great to work with. Nylon sheath, but it's nice and fits well. This is a keeper. Gorgeous knife, and it slices brisket like a chef's blade. Would work nicely on just about any kind of meat, alive or dead. It looks like the price got bumped up a couple of dollars, but I would pay $20 for this, easily. A must-have.